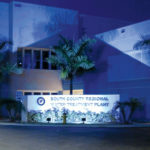 The Collier County Water-Sewer District’s Water Department provides drinking water service to over 160,000 permanent and approximately 200,000 seasonal customers residing outside the City of Naples, Florida. The water supply system covers roughly 240 square miles and includes two hybrid water treatment plants, three water storage re-pumping facilities, three well fields, and one aquifer storage and recovery well. While researching options, the Collier Water Department determined that CyberLock met their requirements. Price shares, “We first implemented CyberLock in 2004. The system has continued to grow as we bring new wells on line and expand our facilities. To date we have installed over 600 CyberLocks.” There are CyberLocks on administrative office doors, re-pump station and well house doors, and electronic padlocks on gates and underground sample stations. “A major benefit of the CyberLock system is the auditing it provides us. The CyberLocks and keys audit lock openings and unauthorized attempts to enter. Almost every Collier County Water Department team member and contractor carries an electronic key that is programmed to access specific locks that allow that person to do their job,” says Price. The audit reporting insures that people are doing their jobs, water samples are being pulled at the correct locations, and scheduled security checks are being made throughout the well fields. "With CyberLock, we can provide substantial proof to the Health Department and EPA that we are diligent in our efforts to secure our facilities and keep the public water supply safe."